Sikkim Chief Minister Pawan Chamling on Wednesday announced to waive off 75 per cent of fees and taxes in a bid to encourage young entrepreneurs aspiring to establish their own business ventures. Chamling made this announcement at the World Entrepreneurs’ Day programme at Samman Bhawan in Gangtok. Speaking on the occasion, the Chief Minister said the youth need to think beyond government jobs as employment and explore ways to be self-reliant. Chamling said the youth should become their own masters rather than being ‘servants’. Further, he asked the stakeholders to take note of market demands while venturing into such opportunities. He also delved on the numerous opportunities in tourism, organic value based, agro based, education tourism and various other new opportunities created by the government. The programme was organized by Entrepreneurs Hub Sikkim where 14 entrepreneurs of the State were also felicitated. 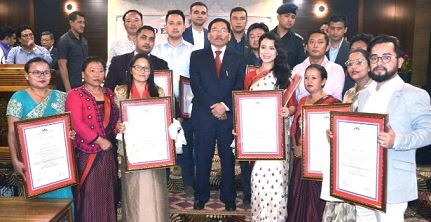 On the occasion, the Chief Minister launched virtual opening of Sikkim’s first Coworking space, launched organic Yacon product by Shoten Group, unveiled Mr Sikkim 2018 official poster, launch of Kiran – initiative of Fidgety Fingers and Sikkim State Commission for Women, launch of Mitho food delivery website and launch of Temi Tea new product – Cordyceps Tea. Beneficiaries of Chief Minister Start up scheme were also handed over the tokens. Earlier, North East Taxi promoter Rewaj Chettri elaborated on the purpose and the importance of World Entrepreneurs’ Day. He said that with the support of Chief Minister, the entrepreneurs’ hub centre has been started at Samman Bhawan and highlighted about the programmes organized under the centre to promote the local entrepreneurs and their products.